Bladder problems can be embarrassing and difficult to deal with. It is thought that around 12% of adults suffer from an overactive bladder (OAB), 85% of these being women. Not to be confused with incontinence, OAB is a condition itself, rather than a symptom of something else. There could be a number of reasons why you might be afflicted with an overactive bladder, below find a convenient guide exploring some of these causes. The type of fluids, and the rate at which you consume them have an impact on bladder functionality. Both caffeine and alcohol increase the production of urine, and caffeine can cause bladder spasms. If you rapidly drink a large quantity of liquid this can overwhelm the bladder and cause a sense of urgency for urination. Consuming smaller amounts at a time should help this. 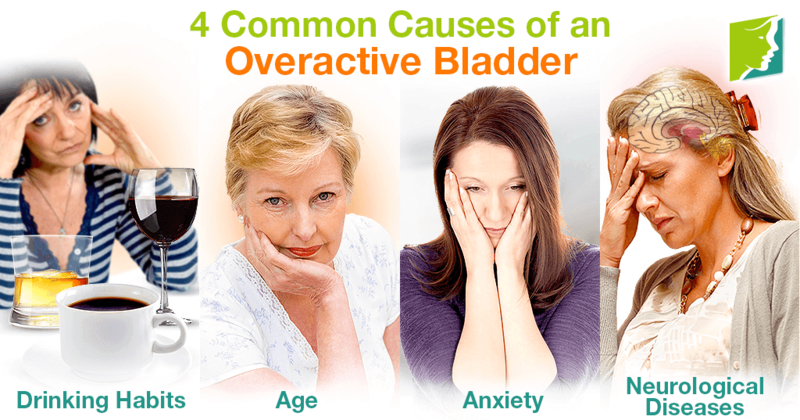 Overactive bladder is more common among older women. Unfortunately, with age comes a degeneration of health, and a number of the prospective complications can have a knock-on effect and cause more problems. Conditions such as mobility and cognitive behavior can lead to issues relating to bladder, in that case, sit close to the restrooms, or practice Kegel exercises to control your bladder. Studies have shown that an overactive bladder in some women is caused by anxiety. Although the reasons behind this still baffle doctors, there have been many women who experience this form of bladder problem and it has been attributed to psychological factors rather than any physical. Unfortunately, this cause can be somewhat difficult to control, particularly because suffering from an overactive bladder can sometimes actually cause people to have anxiety - so the two conditions work together in a vicious cycle. Those who have suffered from conditions such as strokes, or multiple sclerosis, may find that they encounter problems related to bladder control. There are multiple reasons behind this; not only due the potentiality of damage to the part of the brain that controls the bladder, but also because of other effects that neurological diseases may have. Victims of such problems can become less aware of their surroundings, struggle with mobility, or be unable to communicate. All of these are factors that could affect their ability to access the toilet when necessarily, thus adding further strain to the bladder or even causing incontinence. If you feel that you might suffer from this condition, it is important that you discuss your symptoms with a doctor. The aforementioned are just four of the most common causes of overactive bladder, but there are many other potential triggers for this inconvenient syndrome. Although it causes many people embarrassment, and can undoubtedly be problematic in day to day life, most of the time it can be treated or at least vastly improved. For more information about how to manage overactive bladder, click here. When fighting menopausal incontinence, it is important to check both quantity and quality of beverages. Certain drinks can worsen incontinence. Menopausal urine incontinence is nothing less than unpleasant, and those who suffer from the problem want to resolve it quickly.